What is it about today that makes you want to begin something new but you are not quite sure of the best way to go about it or the first step to take? Opportunity is knocking on your doorstep. There’s enough energy around you to make you start thinking twice about all that has gone before. If there is anything around you just now that you have been wanting to change and do in a different way then today is the day to do it. I’m not saying it will be easy as you may not know “yourself” once you start changing your course and others around you will know you even less but think of where this could take you. The energy around the Fool implies that you make decisions that are not based on fact and are more based on instinct. This is neither good nor bad it is just a different way of approaching a change that may be long overdue. Any situation that has been holding you back because you kept doing the same thing over and over again and getting nowhere could be instantly transformed into a different direction. I’m not saying it is the right direction but it may be the impetus you need to propel you out of a bad situation and into something new. The changes you make today will not be small.or even carefully thought out. As the colours on this version of the Fool suggest your actions will be large and the results can be equally as large and impressive. Time to ask yourself… what is the first step you can take? 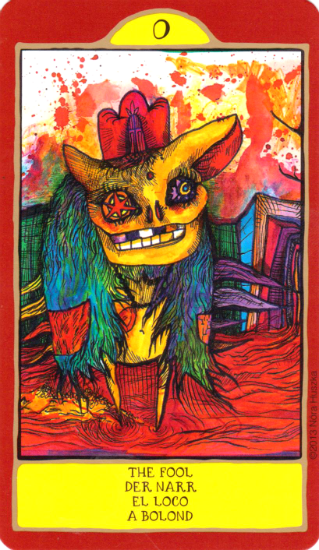 This card is part of the Gypsy Palace Tarot series, designed by Nora Huszka. The creation and marketing of this deck was the result of a successful campaign and funding through Indiegogo.com.